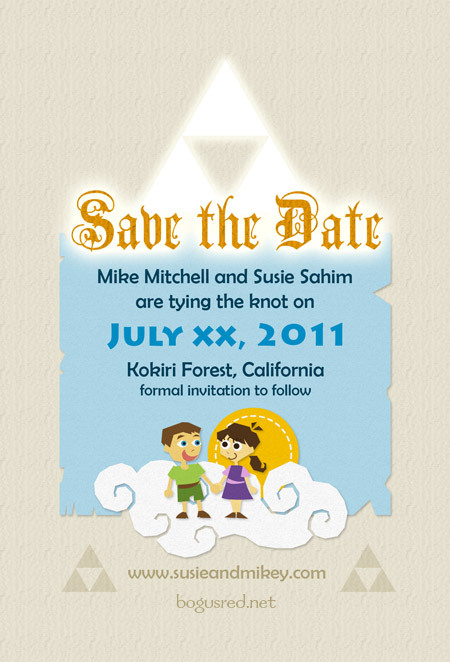 I decided early on that I did not want to do pre-designed invitations and Save the Dates (STDs). None of them feel like Zelda. Almost all of them are flowery motif crap. So I designed all of my own stationary, instead. I've heard the STDs are a chance to be fun and show your personality, whereas the invitations are more formal. I gave the design a very Wind Waker like style and added a cute drawing of Mike and I on it in a paper cut style. I reused some elements from the website design. I got the design printed on postcards from psprint.com (fast, cheap, great quality!). It cost $30 for 100 printed cards and shipping (but I only mailed 70 of them). I then purchased envelopes for $25 through amazon. Include postage and the total came out to about $1.25 each. Not bad, eh?